Hydroplanet is a trustworthy company that has launched another high-quality product. Their indoor growing supply store is located in Wheat Ridge, Colorado. 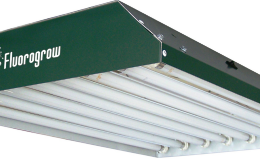 The company isn’t international, but still manages to deliver state-of-the-art growing fixtures that are getting rave reviews from a wide variety of different customers. Regardless if you are a hobby grower, or a manager of a bigger growing facility, you can trust the quality of Hydroplanet products. Just note that Hydroplanet isn’t a high-end producer, but instead, caters to the mid-range clientele that don’t make any compromises regarding the quality of the products they use. 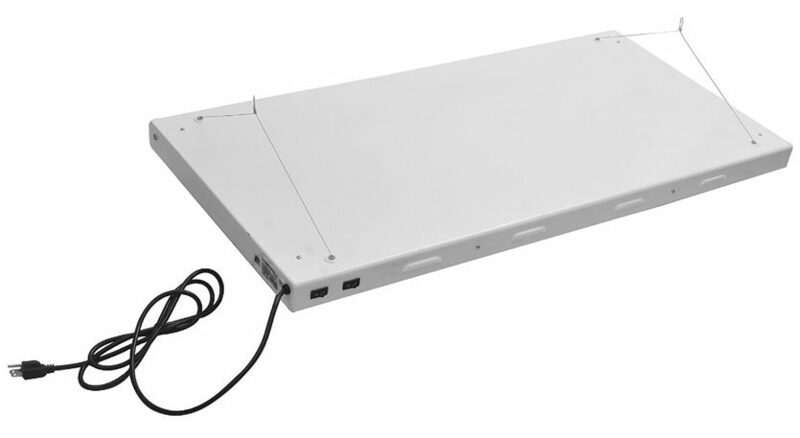 Are you looking for a growing fixture that would have a good quality, decent size, and more than acceptable lifespan? 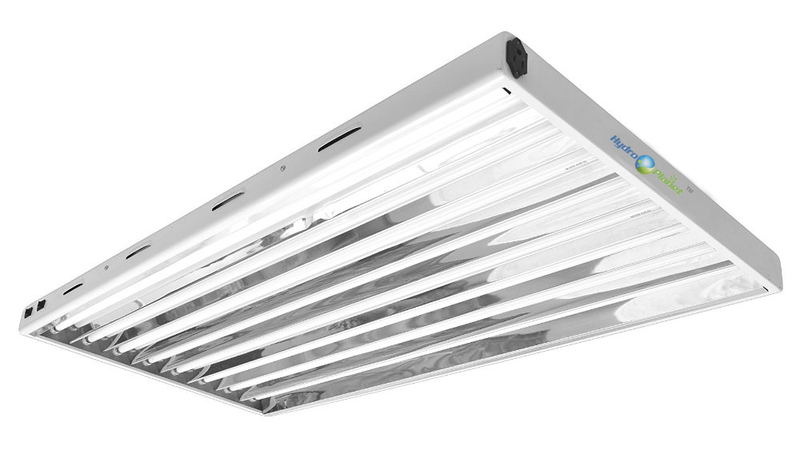 Then look no further than this Hydroplanet 4 feet 8 bulb T5 fixture, because it is the perfect light to fulfill you grower’s needs. The plants flourish, stems strengthen, and flowers bloom under the eight 6,500 Kelvin bulbs. These bulbs are known as plant growth aids. This is due to the fact that the bulbs’ output is similar to actual sunlight. 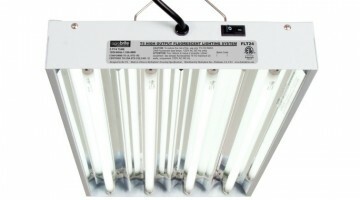 So T5 grow lights are a top choice for indoor gardening, patio, lawn, and hydroponics technologies. 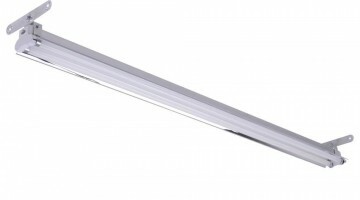 The weight (33 pounds) is standard for this kind of fixture solution, and this durable fixture can be secured both horizontally and vertically. Additional features consist of eight lamps that can be replaced when necessary and a 15′ power cord, that will help you get that ideal lighting position for your plants. 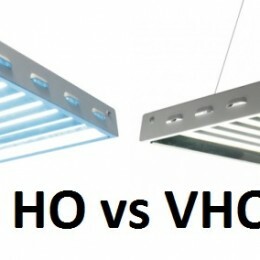 Furthermore, you can be sure that this Hydroplanet growing fixture supports daisy-chain suspension, which helps you connect similar lighting structures for a more effortless, powerful, and illuminating final result. There’s always a possibility of daisy-chaining two or more Hydroplanet fixtures in order to lower maintenance and replacement costs. Hydroplanet takes great care in issuing a proper housing for all of its growing fixtures. 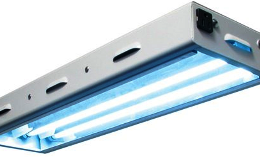 The housing of this T5 fixture is coated with durable powder. The shell is white, which means that it’s suitable for most spaces because of the relatively neutral color. And if you wish to have another color fixture, then you can paint some of the parts with a designated heat-neutral paint. For more information, consult an expert or a shop clerk. Each model comes complete with a strikingly reflective aluminium interior that is made in Europe. The interior design ensures a balanced and concentrated flow of light for the illuminated plants. 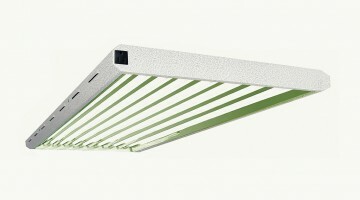 At 50 x 27 x 5 inches (127 x 68.58 x 12.7 cm), this growing light fixture is a few inches bigger than some of the competitors. Still, this isn’t too big or too massive, making it a great choice for kick-starting your plants’ growth.